I held twin boys…and marveled at the beauty and tender heart of their mama. I finally started writing notes/messages to strangers, only because I didn’t have anything for you until now…but I do. it all matters…all of it…nothing is wasted…this is the beauty of now. feel free tell me your beauty of now in the comments…even the gritty parts are good. Man did I need to read this right now. Especially “kindness can be so audacious, that’s exactly where I want to be…in the place where it feels impossible, even if it’s scary and unknown, because that is exactly where the greatest magic lies.” I have been feeling the struggles of kindness this morning in the midst of a nasty comment on my blog. It’s hard not to “bite” back… but I haven’t and I won’t. It’s not worth it. Thanks for your beautiful posts! I always look forward to them! How many times have the things you’ve ‘what-if’d’ come true exactly as you thought they would? What if it doesn’t go exactly that way and instead, something wonderful happens? Is it ever as bad as we imagine it will be? Isn’t it usually so much better and softer than we thought? And surprising – because we were so sure it would be awful, but then it’s not. Yes, I ended up marrying him. 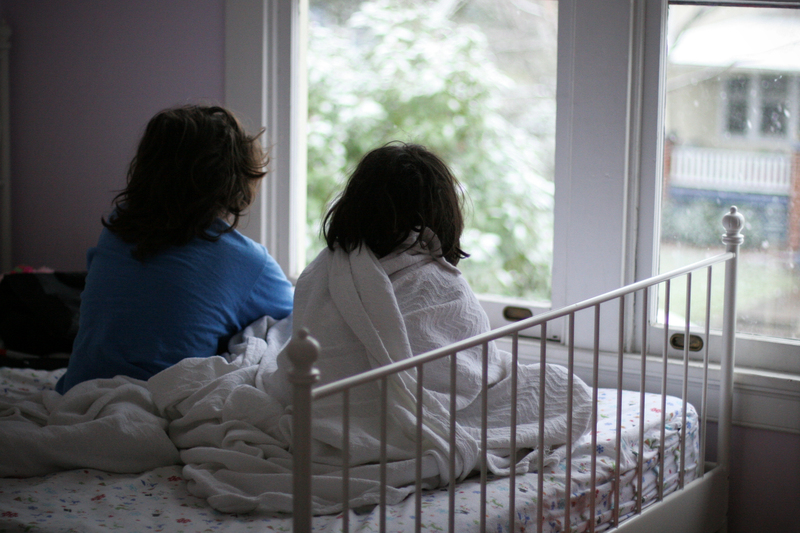 That picture of the kids watching the snow fall makes me smile and feel cozy. Thanks for sharing a beautiful moment with us! Cannot help but think of Eckhart Tolle’s Stillness Speaks or The Power of Now when you asked for comments on the beauty of now. It is so easy to get caught up in worrying about the future, totally losing what is right in front of you in the present. My mantra is now “Still” – I think of this word all the time, as it forces me to slow down and live in the moment. Thanks for your lovely post. Your so brave to embrace everything and follow your heart. I keep saying I’ll be like that someday soon. But a little something inside holds me back. A combination of reasons I guess. It’s funny though how I attract myself to those who are like you. I hope by surrounding myself that one day I will blossom. that’s a reason I love your blog. It’s like the me I hope to someday be. It’s inspiring. I hope carma brings you as many blessings as you bring us! As always, thank you for being here, for showing up right now. i certainly needed that reminder to follow the joy and call of my heart… it’s much easier said than done, but each day i’m trying to listen more closely to what it’s silently trying to tell me.